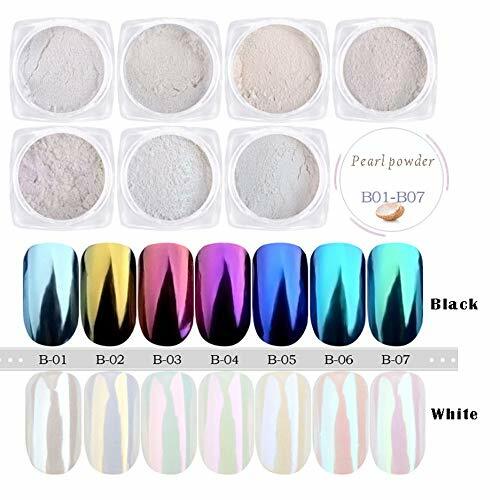 These magic nail powder will appear pretty shining pearl range nails over white bases, also get color changing depending on different angle light reflecting off it. The end result can completely different to show a chrome mirror effect when used over a black base. Actually it can be used with any color varnish, UV builder gel, gel polish and with acrylic. How to creat your white iridescent coffin nails? You will need white gel base, no wipe top coat, and uv/led lamp. 1. Prepare your nails with non wipe top coat and a white gel (UV gel/gel polish) and cure. 2. Use the applicator provided to pick the powder and apply it onto your nails. 3. Once applied rub the glitter nail powder, rubing back and forth untill you're satisfied with the effect. 4. Wipe off the extra powders on nails and seal it with top coat and then cure. ● Recommended for use over a White base for the best effect. ● Also suitable for very fine sugar look and also be optimally processed as normal glitter. Pearlescent Gloss: The aurora powder shinning like sea pearl and will giving your nail feeling like pearl when you apply it with white base gel. Chrome Effect: Ultra fine powder takes great chrome effect, if you like the effect as picture, so you must apply them with white gel or black gel. Endless Combination: It will change color according to the light and different color gel polish you apply. 7 jar nail powder can match with any color gel polish, get endless combination effect. Package: 1 g/box * 7 diamond pearl powder with well seal box and package + 7 brushes + quality promise.